Looking for a Summer Job that's not just the same old thing? 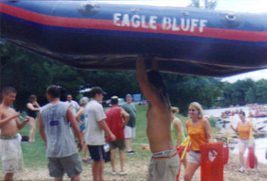 Eagle Bluff near Tahlequah, OK is the Home of River Fun! We're looking for Friendly, Helpful, Smiling people to help our Guests have Fun on the Illinois River. Over the summer we help many thousands of Guests have fun. That takes many helping hands and takes varied skills and strengths. Check below for some of the opportunities offered at Eagle Bluff. Here are some of the positions we fill every summer. Fun is important, but your values are too! We look for honest, hard working, drug free, non-smokers. If you'd like to join us in providing Fun for our Guests, submit the form at the end of the page and we'll contact you. You'll have fun too! Our Crew floats FREE! Move boats, mow, weed eat, clean-up campgrounds, and whatever else needs doing! Open Friday afternoon thru Sunday morning, the Grill Staff prepares and serves Breakfast items, Hamburgers, Fries and more! A professional, commercial kitchen makes all the food much tastier! Sign up Floaters and Campers, Answer phones, Make Reservations, Take care of our River Store and more! Never a dull moment here! Taking care of our Guests after hours. Check for wristbands. Help Guests find their site. Security is here to keep Guests safe and happy! Transport Guests. Entertain Guests with Safety Information and Rafting Instructions. Fill in where ever needed to make our Guests, Happy Guests! Cabins, Shower Houses, Campgrounds, Everywhere! One of the most important jobs at Eagle Bluff. Eagle Bluff is open 7 days a week from May 10th thru September 10th. What days would you need off during this period? Please include info about part days. Are you currently a student? What extra-curricular activities are you active in? What experience have you had in summer heat or water activities? I agree to background checks and drug testing.